Deerhill is sleek and trendy leather holster phone case for those looking for a bit of style to carry their smartphone This case serves as a sturdy holster for men or a small phone purse for the ladies. Handcrafted and tailored to fit any smartphone device with any type of protective case or extended batter pack installed. Very nice smartphone case. Detailing was perfect. Couldn't be happier! The case I ordered was a custom size and they built it exactly right. The workmanship and quality is very high. A product of this level does take time to make so you have to be patient. I am very happy with my purchase and wish this company could expand their product lines. This is my second Story case that I bought for my larger iPhone 7 Plus when I transitioned from my iPhone 6. I went with the same superb Deerhill lateral case but this time I went with the snap button clasp method rather than the belt hook. On rare occasions my old case would come off my belt so I thought the 2 button snap mechanism stay on better. It does not. It works MUCH worse. The snaps are not tight enough to make a truly secure connection so they are frequently snapping open, particularly when I am going in and out of in a plane seat or my car seat. I had to sew on a Velcro strap to remedy the situation. It works great now but all too often its just the velcro strap holding the case on, not the button snaps. My next case (iPhone 8?) will not have the button snap option. Just wish the leather was softer as it kinda looks like plastic but still like it! This company takes every detail with great care and professionalism. The case I asked for was beautifully constructed in every way. By far the BEST phone case I have ever seen and the very BEST in functionality. I ordered an iPhone belt clip and went thru the customization process. Extremely user friendly interface with a great variety of options to chose from. Completed the process in 5 minutes, ordered the phone. Got an acknowledgement promptly. Waited to receive the product, took 30 days but was well worth the wait, received a finely crafted product made to perfection. Highly recommend this to anyone looking for a high quality iPhone case. I have purchased so many of the cheap junk holsters, made by other companies, off of Amazon. They are trash within a couple of weeks or so. I have had this piece for about a month now and I have to say that it is beautifully built. Obviously when you go through the design process you get the idea that this isn't just another junk holster. But when it arrives; you will find it in it's own box, wrapped like the fine piece of leather that it is, you immediately know this one is different. I was impressed with the company calling me to follow up after the order had been received and before my piece was built. Story Leather wanted to make sure that everything was correct. They are friendly, responsive and make a mighty fine product. I totally recommend this company and their products. This Deerhill case is my second custom case from you. In 2014 I found you website and you made a custom case for my Galaxy S5 with a Spigen Tough Armor case. Your case was absolutely fantastic--looks, protection for the phone, comfort on my waist, etc. So in 2016 when my upgrade to a Galaxy S7 Edge took place, there was simply no other place from which to obtain a new case. And this new Deerhill is certainly the equal to the first one.So, I expect you'll have another order from me in 2018 when I next upgrade my phone. we had already ordered a phone case for my I-phone 6,which case I have been using and very satisfied,that's why we ordered an other case for my wife who is also very satisfied. This was the second iPhone carrying case I purchased from Story Leather and like the first one the craftsmanship is outstanding and well worth the wait for such a custom case. The product is so good I ordered a new case for my iPad pro and am anxiously awaiting for it to be delivered. If you haven't tried one of Story Leathers product you owe it to yourself to give it a try, you will not be disappointed, fact is you will be proud to show it off to your friends and relatives. Great materials, outstanding workmanship, 5 stars, keep up the great work. I am a repeat buyer and all I can say is that this is the best product, material and workmanship you will find for the money designed the way you want it. Period. What else can you say, right? Highly recommended. "Nuff Said. Precision sizing and stitching. Mine was sized about a tenth of an inch longer than standard to handle the Otter bumper mounted on the Iphone6. They telephoned to go over all specs and confirmed via email. Two belt loops add security for this fairly large holster. Well pleased with the beautiful Ostrich pattern in the leather. I was impressed with the initial phone contact made to be clear on the details. My request for a custom cell phone case was a little different. The website was very clear on the options. I was able to walk through the ordering process easily. When the holster case arrived, I could not have been more surprised and delighted. The fit, with the unusual request, was absolutely perfect. I love the texture and color of the leather and trim. It is very professionally done. I was going through a iPhone case about every 2 months. The made in china trashy ones from Walmart. I did a lot of web searching until I found storyleather.com. Hand made in the good old USA. I designed my iPhone case the way I wanted it to be. My iPhone with a lifeproof case fits great in my new case. Thanks storyleather for a great handmade leather case. My iPhone 5 case arrived about a week ago and I am very pleased with it. It is a high quality product and looks attractive. I have had trouble with other pouches sliding off my belt (e.g. on aircraft or when horse riding) so I chose the anti-slide option and now I can stop worrying about the phone falling off my belt. This is a beautiful, well-made product. I have been searching for a stylish, holster type case to replace my old, worn-out one for quite some time and I am not disappointed in the one I had made. Even though it was more expensive than my last one, I fully expect it to last for a long time and I like it so well I know that I will not tire of it. I will certainly order again from this company as I am that happy with my product. Great selection, workmanship, and quality. Took 25 days to get it to me, but well worth the wait. Have already recommended this company to others. Extremely satisfied with this purchase. Leather is awesome and of excellent quality. Will certainly recommend to anyone. I got tired of the cheap phone pouches that didn't seem to last but a few months - at best. They said they were "leather", but I question that. I could also only ever find it in black. One company advertised it in brown; I ordered brown; and got black. Ultimately, I always got what I paid for. The Deerhill case I ordered was perfect - the color I wanted inside and out and it fit my Turbo Droid perfectly. Most importantly, it was of durable quality leather. BEAUTIFUL. There is a definite pride in workmanship in every detail. I'm sure this will outlast the phone - any phone. But, as with all fine quality leather products, I look forward to the character it will build with age. Just received my custom made holster for my iPhone6 and I could not be more pleased! Once your order is placed it takes a little while to receive your product but it is well worth the wait. The fit, finish and functionality is beautiful and a joy to wear. So glad I found your company and took a chance on youT Thanks!! spiffy. stays on my belt all day while I ride . like to look classy while in the saddle ! I received mine a couple of weeks ago. It is great quality and workmanship. I have never had one with a belt clip before so it is taking quite a bit of getting used to because of the size, etc. This is for my 1st Smart phone...my old cell phone was small and fit it a picket nicely but the smart phone is so much larger. I have purchased your product previously for a gift and it was well received. Excellent Quality, This is my 2nd purchase. I ordered a different color and I adjust my measurements to fit my IPHONE 6 Plus with a case. This is my first time ordering anything from Story Leather. After a lengthy wait; It was worth it. 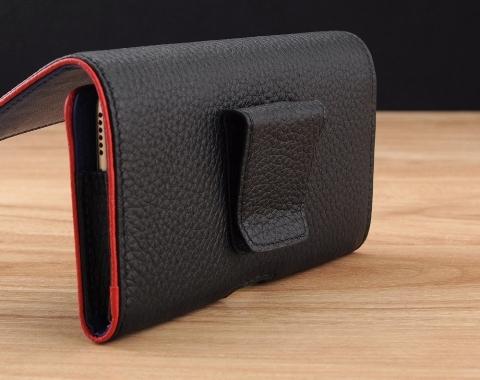 I have received the Best-Awesome looking and fill leather pouch for my iPhone and money I've ever seen. It's true; GOOD THINGS DO COME TO THOSE THAT WAIT. Purchased a pebble grain leather holster with belt clip from Story Leather. Provided exact dimensions of my Iphone 6 with plastic case to Story Leather. Glad to report they did an excellent job and my phone/case fit perfect in the leather holder with belt clip. Love my Story IPhone6 leather holster. Can't wait to make my next Story Leather purchase! I purchased a new iphone 6s and of course I needed a new story leather case. The new one is just as perfect as the first one (iphone5) and the first one being 4 years old is still in great shape. Thanks again. First: Thanks to you, Story Leather! Thanks for not exaggerating on your website. Thanks for honestly portraying your product, your services, the expected time lag for a custom order, and the huge amount of custom options! It's rare these days to see honesty and integrity in action. Thanks for being part of that group. O.K., now to the review: Exactly as advertised. Clean, professional, strong, all my requests catered to. All components high quality, and, most importantly my ridiculously high priced ($600.00) phone is perfectly safe, and looks good while being carried about in a classy case! This pouch is by far the best accessory I have ever had for my phone. The quality of the craftsmanship is outstanding and the materials are fantastic as well. The only problem was that I did not want the hole in the bottom. I kept it anyway because it is very nice and well made. They even put a pocket inside for my c.c. and I.D. at my request. I will absolutely tell people about Story Leather. I'm going to get another pouch made soon. This is my second case from here. Apple made the iPhone 6s slightly larger than my old iPhone 5. Since I was so happy with my old case I had to replace it with this company. I received my Deerhill case for my phone about two weeks ago, and I have been a very satisfied owner of a product from Story Leather. The case has no flaws! The leather texture is consistent and smooth. There are no unsightly creases in the leather. The stiching is straight, continuous, without splicing. The inner lining, which is also leather, is just as finely crafted as the outer leather. All in all, the case is an attractive, luxurious accessory. Good designs and Excellent workmanship. This is my 2nd purchase. Very happy return customer. The Deerhill arrived exactly as I ordered it and fit my iPhone 6 plus perfectly. It was shipped within the quoted time frame. Very high quality and I will definitely order again in the future. This is my third Story leather case - I've ordered one for each cell phone upgrade - and each has been an absolutely beautiful piece of craftsmanship. The fit is perfect, the leathers just as described, and oh so aromatic. I couldn't be happier, and have recommended Story to several friends. I never even knew it was possible to have cases like this made for you. The craftsmanship is exceptional. I purchased this for my wife and she loves it. I purchased this holster for my husband's iphone 6s. I loved the ease of dealing with StoryLeather's site and people. My husband has had several holsters over the years and StoryLeather's holster is by the far the nicest one ever--great quality leather, cool styling, and a STRONG clip! Would definitely recommend StoryLeather! Thanks to the Story team for all their help in sizing my custom case correctly. My initial calculations seemed incorrect to these professional case makers and I received a phone call to verify...and I'm grateful they did, twice!! The case fits the phone perfectly and I couldn't be happier. The workmanship and attention to detail in this high quality case are superb, I'll be back!! I ordered a leather case a few weeks ago, the process was good, shipping was very good. Most importantly the product is great quality. Because it is higher quality the case has been a little stiff but it has already started to work in. I bought this case for a new iphone 6+ and just like the previous iphone 5 case it was perfect. The only down side is owing to the 6+ it's HUGE! I feel like I have a purse on my belt (I'm a guy so that's a negative). It's beautiful, though, so I guess it's O.K. No real way to get around it. My son teases me that I'm carrying a tablet. Sort of. In the absence of being able to find anything decent in my local (Australian) area, I went online in search of a belt-holster for my new iPhone 5s, and discovered the wonderful range of custom made, real leather products available from Story Leather. I am totally satisfied with the product that was delivered to me, even though it took quite a while to be made and shipped way out here in the far-flung antipodes. And whilst it was fairly expensive, I'm put in mind of that old saying, "The quality is remembered long after the price is forgotten." This sentiment is perfectly true in this instance. Thank you, Story Leather, for a beautifully crafted and stylish, quality product that I know I will have for many years to come. I would not hesitate to buy another product from this company, and will have no hesitation in recommending them to my friends and family. The product met all expectations. The packaging and shipping were first class. The holster was exactly to order and looks very well made. It was nice to get a little something extra (small key holder) in the package as well. Wow, after looking for what seemed like a lifetime I found someone that understands what a pain it is to find a case that fits my phone and the bumper case I put on it. I have an iPhone 6 Plus with with a Rokform bumper case. The process of selecting the material, entering the measurements, and deciding on a belt clip was worth the extra money I spent on this one of a kind custom case. Keep up the good work, and I look forward to many years of service from my Deerhill case from Story Leather. My case arrived exactly as ordered, perfectly sized. The leather appears to be of good quality, the lining is soft and protective; the case itself is substantial and offers great protection for a new Blackberry Classic. Absolutely delighted with my purchase. Ordered this for my Galaxy S5 with extended battery case.... PERFECT! Review by Pete M.
I Ordered this for my Galaxy S5 with extended battery case...it is so nice to deal with a Company that makes a quality product. They even emailed me to make sure the dimensions were correct. I certainly would recommend Story Leather to any one that needs a custom made quality case. From the variety of options and the custom sizing to the finished product was second to none.... I am VERY pleased with my new phone holster. Also the customer service was great with request for size confirmation and they even held up on production for me when I made a quick change from Samsung 5 to the iPhone 6 which required changing the dimensions with my order. Great craftsmanship on real leather. Custom fit for iPhone 6 with Otterbox case and it fits perfectly. Only that would make it better would be a rotating clip - may have missed the option as I built it. Ordered a custom holster for my IPhone 6 Plus with the Mophie Juice Pack. Perfect match to the dimensions I provided. Loved the genuine leather smell quality of the holster, excellent stitching, worth the wait. There is no question about the attention to detail and quality of the workmanship of this product. Everything is as good as, or better, than I expected. I would definitely order again from Story Leather. That said, I hope that they make some improvements to their website. When building a custom product it is difficult to zoom into some items to really understand how they will look. I ordered edging that I thought was gray, but turned out to be glossy silver. Also, my product was a holster for an iPhone 6+ that sits horizontally. This turned out to be a mistake and I should have ordered something with a vertical mount. Wish they had a rotating belt clip so that I could just rotate this. Of course it wouldn't open in the right direction, but it would be a bit nicer - I think. I love my new phone holster. It fits perfectly and the workmanship is excellent. This was well worth the price and the wait. I highly recommend this company. Very pleased. The phone case was for a new style of phone and the fit and quality is very good. This is a wonder case for my iPhone. It is worth the expense and the wait. Thank you. 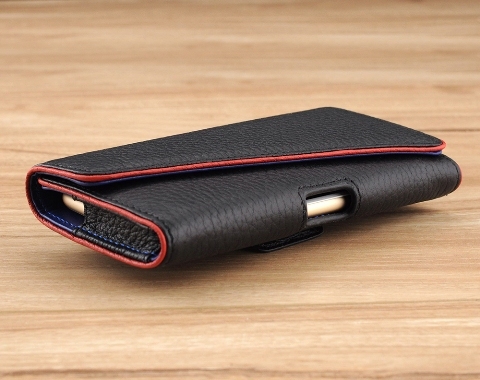 I just received my new pebbled leather with smooth leather trim iPhone 6 case - and am very impressed. It is of superior quality and style - very classy and rich looking and fits the iPhone 6 perfectly. Well done! I could not be more pleased with my new holster expertly designed and manufactured by Story Leather. It is extremely beautiful as well as functional. Great value for the investment! The quality of the leather and the construction are second to none, really peerless. I look forward to this piece enjoying a long life. When it wears out, if it ever does, should I still be on planet Earth; I will simply order another one. Thank you Story Leather for your outstanding product! Story Leather is the only place that can make a custom case for ANY phone with ANY protective case. This is my second case. Last year, I bought a ZAZA for my GS3 with a custom back.I got lots of admiration from anyone who saw it. And it has the great wear and appearance that only quality REAL leather gives.. I still have it even without the phone. When i upgraded to a GS5, I needed a new case for a bigger phone with a protective case. This time I chose a Deerhill and am just as happy. as last year.. I chose ostrich leather with a chamois lining which looks very expensive and feels great. I also chose a magnetic purse style snap which is more secure and a custom fit snap over belt loop. This makes it easy to put on any of my belts and will not pop off when I sit down or dig into my side. Remember, this is a CUSTOM case. YOU choose the style, the liner. the closure, the belt holder. If you do not see what you want, ASK. Story Leather will make it THE WAY YOU WANT IT! I finally have a case worthy of my iPhone 6 plus! Before getting the Deerfield I was using an ill fitting generic case. I had a feeling that the custom case I ordered would be something special. It seemed like an eternity between the time I ordered it and it's arrival (like waiting for Christmas). The first thing I noticed when it finally arrived was the handsome box and packaging. First class. The case is made from the finest leather with beautiful piping around the edges. The lining is very soft and protective. The design is beautiful and functional. The phone is held securely, but is easy to remove. The monogram is classy. Kudos to Story Leather. I have been searching for a belt holster for an iPhone for a while and bought a few. All the others were cheap quality and some broke after a short time. My shirt pocket thanks you. The price was right, the value better. I am convinced that this holster with the belt loop will outlast three or more less expansive holsters. I know because I have gone through multiples holsters of lesser quality in 18 months. Given the quality, it's looks, and price this is by far a better value than multiple holsters of lessor costs. I wanted colors I wanted, leather I wanted, bit for phone I wanted with waterproof case I use with belt loop I wanted .. and they made it MY WAY. Spectacular service. Impeccable style. Well worth every penny. Great customer service. I see others have also commended about this. My iPhone 6 plus fits great and I have no trouble getting it out and in, but I have a clear plastic case with thin rubber around holding the phone. With the case on it is a very tight fit and hard to get the phone out and in. I have to take the case off to use the pouch. If only it was one-half inch longer it was be perfect. Still would recommend it and like the product. STORY LEATHER UPDATE - We tailor the cases to the dimensions provided, if the dimensions provided for the order included the plastic case, it should fit just fine without any problem. 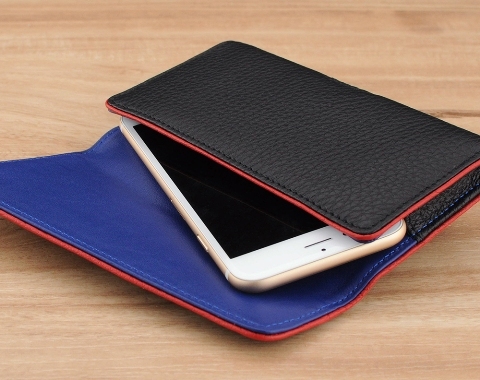 Additionally, the leather case will stretch given 1-2 weeks of consistent usage. I bought the phone case for my husband as a Christmas gift. He selected the style and color, and he just loves it. The only small issue is that we gave the exact measurement of his iPhone 6 Plus, and so it's a pretty tight fit - a little hard to get out of the case. He did have one suggestion - instead of putting the "push hole" in the middle under the case where you can help push the phone up and get it out, maybe put the push hole under the case on the edge, rather than in the middle. Overall, he loves it. STORY LEATHER RESPONSE - Leather cases will stretch after 1-2 weeks of consistent usage, the fitting issue will ease thereafter. The craftsmanship and leather are top notch. It is a very beautiful case. I cannot even tell where the stitching begins and end (no loose ends). My phone fits exactly right within the case -- perfect dimensions. While the case seemed expensive compared to the prices of generic cases, it is well worth the money. It should last a lot longer than the phone will last. If the next phone I get is a different size from my present phone, I plan to have Story Leather make a new case for me. What a great product! Very classy and totally worth the wait. If you are the kind of person that pays attention to detail...you will be very impressed. Worth every penny! This case is wonderful. I ordered this case for my new iPhone 6 Plus. I special ordered the size to fit the phone plus have the Otter Defender case on it and it works perfectly. It was worth the wait and it isa premium quality case made tomy specifications. In November I purchased a new iPhone 6 in replacement of an iPhone 4. I had a horizontal belt clip with my iPhone 4 and liked wearing it but obviously the new IPhone 6 wasn't compatible. I googled cell phone belt clips and found the Story Leather site. In browsing the site, I could tell I was researching a top notch cell phone protection company. I easily found the horizontal leather belt clip I was looking for and orderd to my specifications. As advertised roughly four weeks later I recieved my new handcrafted, custom, monogramed leather belt clip. I've used it every day since. Perfect! I love my new custom cell phone holster, my iPhone fits perfect and it looks great. It really is a quality purchase and I was surprised by the product presentation. It arrived in a blue jewelry box, wrapped in a cloth with the company logo on it, very nice. Over the past 20 years I have purchased a few dozen belt cases for phones, PDAs, etc. and find this one to be one of the best in usefulness, quality and look.getting a custom size is a great advantage, along with custom colors and piping. Glad I found your company, great case for my phone one of the best. Outstanding quality, As with any good leather product, it will take a bit of time to break in. I had asked for a belt clip that had a loop as well (when I ride my motorcycle I worry about clips getting pushed off my belt) and low and behold when I got my iPhone 6 case, it had a very well designed loop that snaps into place. Everything that was promised, and more, was delivered, including delivery times. Thank you, I've already been showing to friends. Based on the price and the look of the product on the StoryLeather website, I knew it would be a nice case but when I actually unboxed it I was surprised how good the product was. I was struck by now beautiful the case was then quickly after that how sturdy and durable it is. This feels substantial. I think it will last me a long time. The leather is heavy-duty as is the stitching that holds it together. The belt clip is wide and well stitched into the case. The best case lateral phone case I have ever bought and quite frankly the most expensive. Its well worth the price. I am a very impatient person and when I ordered Thai iPhone 6 Plus case I had to wait a little I wr 39 days. But after I received it I can say without a doubt it was worth the wait. The wailing is top notch with great craftsmenship. I would recommend their products to everyone who care about owning the best quality products available. I am simply thrilled with my purchase. My custom case exactly as ordered with coffee leather, orange piping, baby blue suede inside, big belt clip, and slot hole in the bottom. I ordered my case/holster to fit just iPhone only but it actually fits perfect with luvitt case. I'm very happy I took the time and paitently waited for this custom order and I have recommended Story Leather to all my family and friends!! I have had over 20 cases for iPhones,old Palm Treo phones done in leather. These by Storyleather for iPhone 6 plus are best quality and appearance and ability to customize entire case re belt clip types or no belt clip let case be exactly as you wish and case with or without phone protective case or naked phone to go in case you order. I was exceptionally pleased with my custom case, and truly marveled at the attention to detail and quality of my case. My iPhone 6 Plus with Apple case fits perfectly in the custom case. I love this case. I got tired of asking for replacement for Otter belt clips. This case is practical and looks and feels great. Worth the money. When I placed my pre order for an iPhone 6 plus, I started to search the web for a caring case. I happened upon the Story Leather website and thought if the product was half of what they touted it would be worth the chance to purchase, Well to my surprise the case was exactly as advertised, elegant, great workmanship, fits the iPhone 6 plus superbly. It was well worth the wait and I will be placing another order shortly. I bought this ceasefire my iPhone 6 plus. The craftsmanship is wonderful. I do, however, have one regret. The phone is so big that a horizontal case sticks out too far to be truly comfortable - my mistake, not Storyleather's. I've reordered a vertical case and am excited that it will arrive soon. Avoid my mistake and go vertical. I was amazed by the quality when I received my case, they did a great job, and I am Loving it. I've always preferred folio style cases but anymore since phone sizes vary it's hard to find a case that fits my phone from the store. I stumbled upon Story Leather and was happy to see such variety and custom made cases. I have a Lumia 1520 and they made the case and it fits the phone perfectly. Great materials and awesome craftsmanship. I bookmarked the site and will always come back for cases when I upgrade my phones. I can't say how much I love this case! My phone case was made to fit precisely and it looks great. This is the best quality case I have used. I have been searching for years for a quality leather case for my smart phones. Never have found one made of real leather before this one. Forget the $3,5,or $10.00 cases. These cost 10X more and are works of art. The quality is exceptional and it fits like glove on my Galaxy S4 with Otter Box Comuter Case. It even comes in a very nice box would make a great gift. Highly recommend to anyone who wants a custom made leather case that really is a work of art. As stated by another reviewer "you get what you pay for" . This is the place to get what you want. Very good quality. My phone case exceeded my expectations! It os extremely well made and fits perfectly. I will indeed purchase from Deer Hill. My next purchase will be a handbag. This kind of quality and service are nearly extinct! I love my Story Leather case for my HTC One (M8). Quality the Best, fit well and order as customer requested. 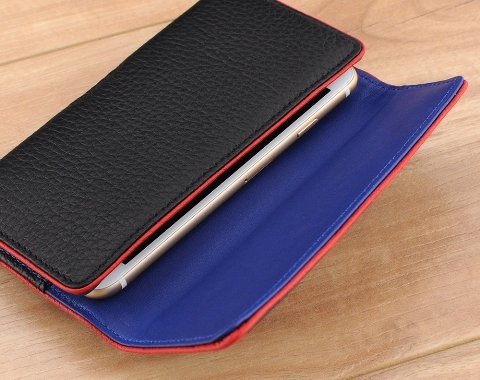 The case created by Story Leather is the best case made for any cell phone. Custom made to any phone with a protective case. I've had a couple of cases from overseas manufactures and they looked alright in the beginning and at a lower cost but soon fell apart and learned again that you get what you pay for. I've been toting mobile phones around since the early 90's and usually on my belt. I was a bit concerned about the size of the Galaxy S5 and the case that would hold it. I began my search just about when the S5 was released, but most of the cases advertised looked really huge and clunky and and when I happened upon the StoryLeather website I was happily surprised. Custom made to the exact measurements of my phone was what it said. And that is exactly what I got! The case is sleek and excellently put together. It fits the Galaxy like a glove. Well worth the expense and the wait. I was stunned just to find a company that seems to understand that the 'one size fits all' approach to smartphone cases is absurd. Although some might feel that the cost of the custom made case is a little high, I was highly impressed with the quality of materials and workmanship that went into making this fine product. I am in the process right now of recommending Story Leather to all my friends and colleagues. Bravo! They always say you get what you pay for! Well, I got more than what I paid for! What a great product! Quality was outstanding, and it fit like a glove! Worth every minute of the wait while they made it to my specifications. All of my family and friends have complimented me on this case and said that they will have one for their phone. Great Job StoryLeather! This is truly one place where you can have it your way! PS: Did I mention this is the only place to get a case for the Mophie Juice Pack on a HTC One phone! That FITS! I love these products! Well made and made exactly the way I had asked it to be made. If anyone is looking for the ultimate quality product, this is it..
Story has done a perfect job. You produced exactly the specialized case for my wife's iphone five that she wanted. It is beautiful, functional, and exactly as specified. After years of settling for cell phone cases with marginal quality and a poor fit, I have now discovered the source for an absolutely first-quality piece that fits my new HTC phone superbly. That source is Story Leather. The case was perfect in every way, right down to the detail of an opening through the edge that I requested, so I could operate the volume buttons on my phone. I plan on ordering at least one or more additional cases in a different color and I will certainly be back to Story leather when I acquire the next new model cell phone. Just what was advertised, excellent fit, will purchase again when I get another phone. Deerhill holster case for my iPhone 5s. plus! This is not an option I've seen anywhere else. Was very pleased when I received my case! My iPhone fits perfectly. The quality is great and the case is really sharp looking! This was the first case I ordered. The 45 day wait was worth it. Beautiful case, perfect fit, I ordered my daughter a case, she loves it too, and now mine is being made. Very consciencious company. Called to verify my changes to the case. Order from Story----you will be very pleased. I think that I have become used to spending good money and getting cheap products that look good for about a day and then fall apart or start to deteriorate. I was nervous at first about spending a little more for this product because of past experiences. I was completely blown away with the quality and performance of this holster. It is obviously made by hand with great care, and the results are impressive. I would buy another, but that may be a while since this one has no signs of wear. Great product, great service. Worth every penny. Its nice to feel good about a purchase in a world where so much of what we buy is junk. Thank you for my custom case for my Galaxy Note III. I LOVE it. The quality of the leather and the colors are great. I really enjoy the fact that I could order in most of my favorite colors. Thank you for providing a wonderful product. I have already recommended you to several of my friends! I will be back to order other items! They fit my iPhone 5S and Zagg Arsenal case perfectly. Top quality throughout. High quality materials put together with expert craftsmanship. Absolutely beautiful result. I got exactly what I wanted, and the few weeks it took to custom build was not an inconvenience. It was worth it, and the price accurately reflects the great value. I can't be happier with my nexus 5 case. Gorgeous workmanship, exudes quality and good taste. All the customizations were perfect. More importantly, the customer service was excellent. Jerry Lee was outstanding, my guess is that the other CSR s are too. I'd recommend SL to anyone. This case was worth every penny. Love it...Great work!!! I wanted to get my boyfriend a case for his iPhone 5S for Christmas and came upon StoryLeather by Goggling cases for iPhones. I'm so happy this wonderful site was suggested. Ordering was effortless and I actually enjoyed picking out everything to make his case a one of a kind beauty. It took exactly 30 days from start to finish. Delivery was fast too!! I highly recommend if you want a one of a kind truly beautiful phone case this is the only place you should be shopping!! Lots of options and colors. Took awhile to get it but worth the wait. Perfect solution for those who tire of the off the shelf phone holsters. Very nice and classy leather solution with just the right amount of customization. Great for gifts to those who seem to have everything. I am very pleased with my phone case. The quality is far better than I expected. Mine was a custom order and the fit for my Galaxy S4 with a battery case is perfect. I was so pleased that I have placed a second order for my employee, with the same phone, however, this case is a vertical style. He is very anxious for it to arrive. Overall, the product exceeded my expectations. involved. Off the shelf cases cannot compare with this personalized case. I would have no hesitation in recommending and also reordering from them. They are 1st class all the way. Finally - the quality I want. Good craftsmanship and looks like it will look good for years. Very pleased. There is nothing off-the-shelf that is close to this. Love the look & functionality. Only suggestion: make sides out of elastic material to better ease entry & removal from the case. An elastic side would only be appropriate for the horizontal belt mounted versions. This is a great case, made to my specifications and delivered before promise. Great customer service. Only suggestion is a 3D/2D rendering of proposed finished product would be great addition. Excellent leather quality. I am very satisfied. Thank you. This is my second phone case (the original was ready made and had a belt loop). I custom ordered this Deerhill and it is beautiful and has a belt clip. I am very satisfied with it and love the engraved initials..... a touch of class. I now use my original as my knock around case when I'm working in the yard or on my car where it won't fall off my belt. All other times its the new Deerhill belt clip case. Both cases are high quality leather, stitching and soft suede interior. On 1 September, I placed my order for the Deerhill. Before work began on my custom case, Story Leather contacted me to ask me some clarification questions (I even learned why there is a hole in the bottom of some cases - not to allow plugs in, but to allow a finger in to push the phone up...D'oh!). Anyway, Connie Lee was terrific! On 5 October, my case arrived. It is incredible! The look, the feel, the colors, the quality of the leather and the superb craftsmanship all combine to make the case a functional work of art. I have had every kind of case made and none of them compare, in any aspect, to the one Story Leather crafted for me. Thank you Connie and Jerry for a most outstanding product. Just to let you know I have received my order, a custom made holster case for my iPhone 5 in a Mophie Juice Pack and also with a handy slot for a stylus. The holster is beautifully made and I couldn’t be happier with the manner in which Story Leather worked with me to come to the best possible product. Great job! The phone case fit great, looks great and terrific workmanship. Thanks. This is my first purchase and had several questions requiring clarification. Jerry Lee assisted me throughout and the final product is perfection itself. I couldn't be happier! Thank you! Solid case. Very pleased with the appearance and the quality. Belt clips on other cases have been a major problems but this case has a significant wide clip which should work well.Overall very well pleased. Very Satisfied with the product, just one thing I like to say. I noticed on the website that there's now free shipping in the USA. I called Story leather .They would not return my shipping cost.It was only one month ago that I ordered my case. I've purchased multiple off-the-shelf leather iPhone cases prior to finding Story Leather. Until now, they've all been disappointing: either poorly made, bonded leather, parts that eventually tear or come apart. This Deerhill is incredible. Solid construction from genuine leather, quality stitching, superb fit and first class belt clip construction that keeps the profile as narrow as possible without compromising quality. The engraving is a bonus. Can't say enough about this product. Can I make this case to hold a smaller Zippo lighter? I have a Otterbox with my phone, will this case fit? For the Deerhill case, what we have been able to do is to sew in an inner pocket on the inside behind where the phone would sit. The inner pocket would allow for 1-2 cards. You can simply note and request this in the Special Request section as you go through the customization process. Another option would be the Verano case, in which the inside of the cover flap would already have card slots built it. In the special request section, you could request to have a belt clip be added to the back side so that you can clip it to your shirt.